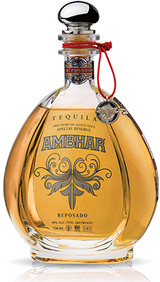 AMBHAR Reposado is an ultra-premium tequila that is perfect for tequila connoisseurs who want a remarkable smoothness. It is rested in premium whiskey oak barrels for 364 days, giving it its pale golden hue. The aging process is timed perfectly to impart a perfect balance of fresh agave, vanilla and salted caramel, making it perfect for sipping or adding it to a premium cocktail.